But, D was also starting to show the signs of “being ready”. He was interested in talking about the potty. He started wanting to take his diapers off as soon as they were dirty (and sometimes did so himself — insert disgusting mess all over the bedroom here). He was more interested in the “big boy underpants” his friends got to put on. I also am very lucky to have him enrolled in a wonderful Mother’s Day Out (MDO) program where the teachers are extremely helpful and supportive in continuing potty training while he is at school. Unfortunately, MDO runs on a traditional school schedule and therefore my window of ‘free’ help was starting to close as summer approaches and school ends. And so, we figured, the time had come to start potty training. I’m happy to report that one month since we commenced on this adventure, we have met my definition of total success! D rarely has #1 accidents and will tell us most of the time if he needs to go, “HURRY!! Pee Pee’s coming! 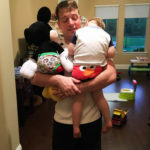 !” I’ve been surprised that he will do this even out and about, like in the car or from the pool at swimming lessons vs. us constantly asking him to go. He’s working on pulling up and down his own pants. He working on pointing himself down into the potty. He always goes immediately to the sink afterwards to wash his hands. We have mixed success on #2, but as soon as he has an accident, he rushes to the potty, most often leading to a #1 success. And we’re still all about “sleeping diapers” at naps and bedtime. I should also disclose that am also a total pawn in his game of chess. I expected the use of potty time to disrupt sleep. What I didn’t expect was to be completely manipulated by a two year-old during timeout. It took about half a day for him to figure out the quickest way off of the steps (our timeout spot) is to allege the need to potty. Like I said, not perfection, but definitely successful! And so, without further ado, below are my tips and tricks to make this process as stress-free as possible and hopefully just as successful for your family. There are about as many approaches to potty training as there are unused, but at the time ‘NEEDED’, baby proofing tools in my storage room, which is to say, there are a LOT! I’d recommend browsing a few, but picking one. We read two books to which I’ve provided Amazon links to below, Potty Train Your Child in Just One Day and Potty Train in a Weekend. (Yes, we were looking for something quick and rather painless. ) Both were pretty easy reads and had what seemed to be practical, simple strategies for success. In summary, the One Day approach recommends having your child teach a doll/stuffed animal to use the potty in the morning. The doll (or Mickey Mouse in our case) will have a series of scheduled potty successes and accidents. 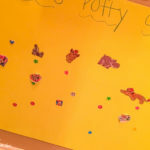 Then following your child’s nap, he/she is now going to use the potty with a big party celebration to close out the day. No surprise, I really liked this party idea! The Weekend approach is really a 3-day program whereby you block yourselves into one room with a potty and your child is naked so you can quickly put him or her on the potty frequently until he or she starts to get the hang of it around day 3, at which time you introduce underwear. My cousins had great success with this approach, and I’m all about referrals, so was very interested in this book as well! We blocked a long weekend and decided to start Day 1 with the One Day Approach and the following days move to the Weekend approach. That was until D was getting a little too much joy out of all of Mickey’s accidents and we worried this might be having an undesired impact. We still had a big party (see below section on bribes!) to close out Day 1, but we quickly realized the rest of the recommendations from this book were just not the best for D and switched to the Weekend Approach around 10AM Day 1. We also had to be flexible on the back end of the Weekend approach as the recommended frequency for sitting your child on the potty was way too frequent for our little camel. As I’ve found with almost everything child-related — do some research, not an obscene amount, and then modify to what works for your family. We’ve been reading about going to the potty for the last six months or so. The books we really like are linked below. My cousin’s mom also wrote the most ADORABLE book, The Shifty Chef, about my niece going to the potty. I’m working on getting a link so you can add this to your collection as well! In addition to books, as our official potty training kicked off, we also introduced Elmo’s Potty Time movie a few times a week. This was quite the hit! 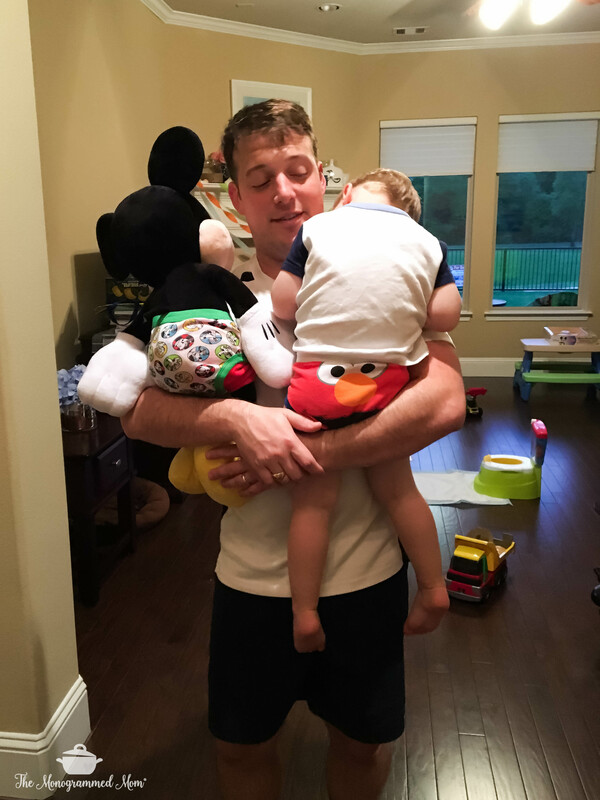 I have experienced the life of a two-year old is one constant battle for control. So in this case, allow your child to have some! 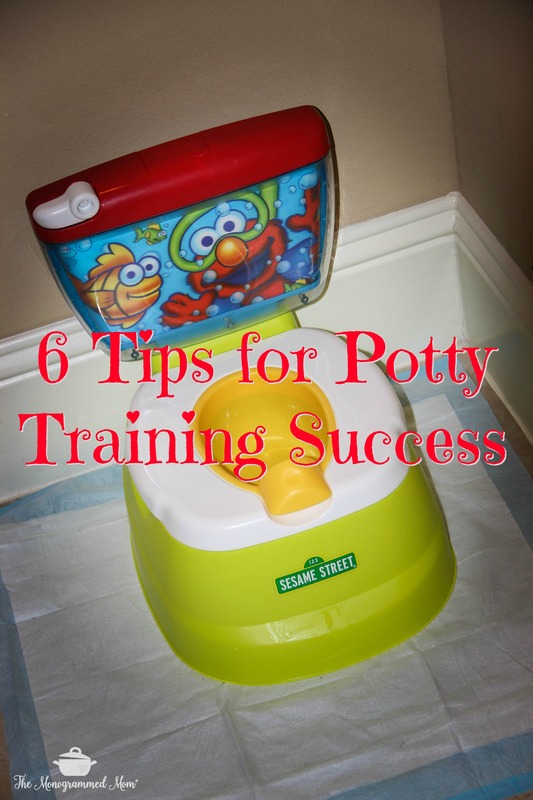 I included D in a lot of the planning process the few days leading up to the commencement of potty-training. 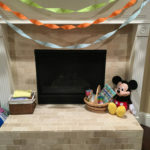 He picked the Mickey themed party described below and shopped with me for party supplies. He picked out his own bathroom stool (a bright pink Minnie Mouse one — WOOHOO! finally, some pink in this house!!) He picked out his Elmo underwear. Now that we’re past the initial stages, I try to give D choices so he can be “in charge”. What underwear does he want to put on? Does he want to go potty first or should I? Does he want to sit on the little potty or the big toilet? Would he like to use his soap or mommy’s to wash hands? Would he like to read a book or look at pictures on my phone while he sits on the potty? We still have the occasional tantrum when it is time to go potty, but letting him control a bit has really helped increase the calm in our house! Sometimes this results in the potty being moved into the living room to play ‘hoop’ while we sit on it…and that works for me! A small potty with a removable cup. We have tried every type of potty you could imagine and this is definitely the type I would recommend. I thought I’d favor the seats that sit onto your standard toilet, especially because these make for clean-up easy, but found most toddlers are not tall enough to get up onto these themselves (and self-sufficiency is the goal, right?). Even with a stool at the base, I find most seats slip when D tries to get onto it himself. We’ve also had a few slips of the seat result in pinched fingers/thighs. No bueno. A small potty is sized correctly for your toddler’s body. Additionally, you can throw it in the car with you on the go and avoid public restrooms completely! (Well at least your precious child can!) And, do not forget to get the one with a removable cup. This will make clean-up exponentially easier. My favorite tried & true potty is shown below. It even has a battery operated flusher! Puppy training pads. Yes, you are training a human, not a puppy. But these bad boys will easily soak up any “splashes” that happen during the process. We always have a fresh one placed under our potty. Now, let me just say, I don’t know what it is like to potty train a girl. Perhaps these would be on the maybe list. But I have a little boy and trust me, if you do too, these are on the MUST list. Fun soap. Remember when I said my son always washes his hands now? That did not just happen by accident. This was part of a well strategized plan to make washing hands fun. Step one, add fun soap to the process. Step two, step back and watch with amazement at yourself that your child thinks washing hands is now his/her idea! 5. Bribery is your friend. There is no shame in my bribery game. Especially in the beginning, I would have started writing D checks if we could avoid this turning into a tearful or messy process! I would recommend mixing up the rewards. These little ones are smart and the minute the sense a routine (i.e. a small cookie for every success) , they’ll latch onto it and start to expect it (and by expect I mean demand persistently by repeating the same word over and over again “cookie” “cookie” “cookie” until a full on melt down commences). 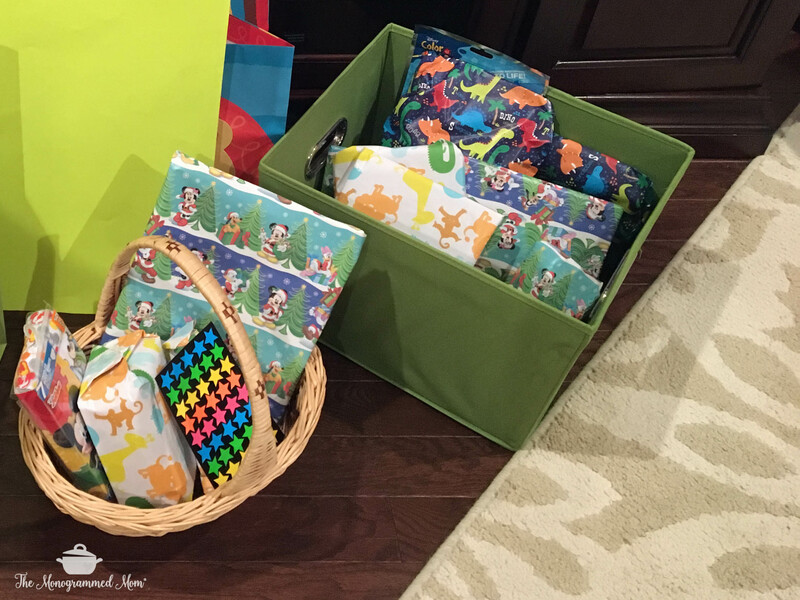 Here is what I’m packing in my bribery arsenal…. 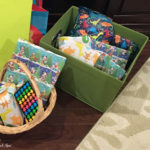 Small wrapped presents (i.e., bubbles, crayons, markers, magnets, coloring books, notepads, and of course – new underwear!) — I suggest wrapping these because it just makes it so much more fun and celebratory, which is especially important in the beginning. A variety of small edible treats — Mini chocolate chip cookies, crackers, chocolate covered raisins, yea I’m calling your name. I also am quite pleased with myself that I pass off gummy vitamins as potty treats (win-win)! Stickers, sans sticker chart — This may work great for your child but after about day 2 the chart was a total bust. 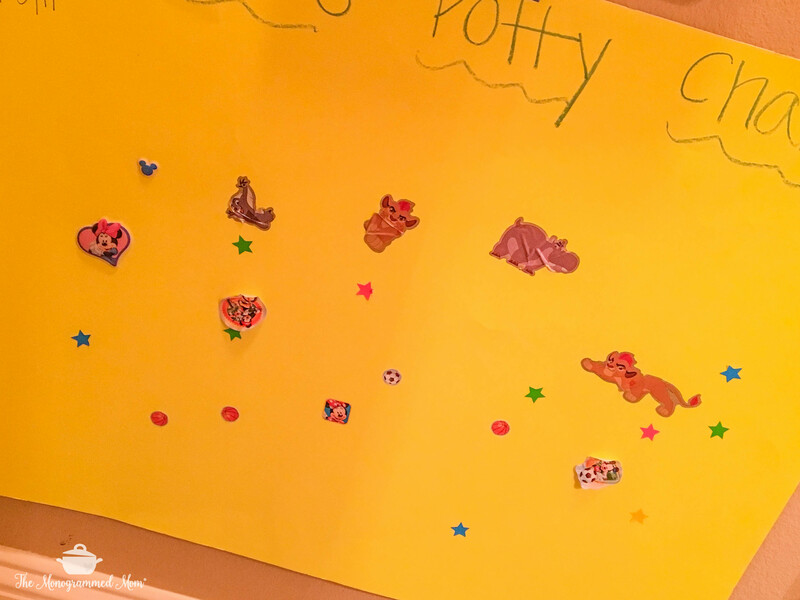 And I’m especially glad that I didn’t put any type of effort into making this chart a fancy organized template with ruled lines because those stickers go where a two year old heart desires, sections for pee or poop be damned. Day 1 Party — As mentioned above, one of the books we read centered around a big celebration at the end of the day. 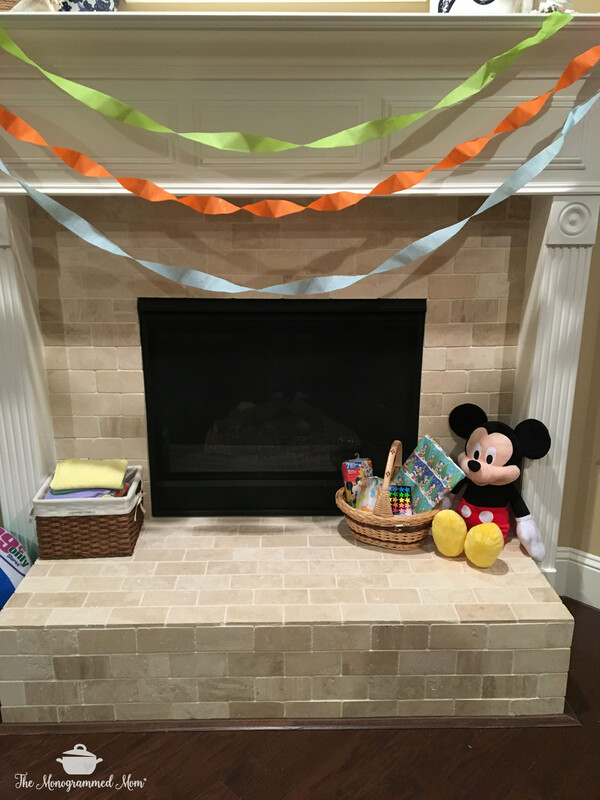 We had a really fun family celebration that was Mickey Mouse themed (it fit in really well back when I thought Mickey would also be celebrating his potty training successes!) I put up streamers, bought balloons, fun hats, the works! My in-laws came over to add to the excitement and we had D’s favorites, pizza and an ice cream cake, to celebrate our BIG BOY! D was the total center of attention, which as an only child is not out of the ordinary for him, but this was different and he knew it. LOTS OF HUGS, KISSES, and PRAISE! Potty-training, especially those first several days can be completely exhausting. You will find yourself needing to dig deep for extra patience on multiple occasions. Keep in mind though that it’s tough to be two, especially when you are expected to learn something new. Imagine you had spent your entire life living one way (diapered without a potty care in the world! ), and then overnight, everyone expected you to live your life completely different (in underwear…consistently clean, dry underwear at that!) To top it off, they’re going to describe sensations that you’ve never paid much attention to and expect you to give those sensations your undivided attention to prevent accidents (a word you may or may not have even heard of until today!) Worst of all, multiple times a day you have to stop playing to attend to this task. Ridiculous! As it is feasible, tag-teaming the first few days is key, especially if employing the ‘naked’ weekend method. This is not to suggest two adults need to be present 100% of the time. In fact, just the opposite. We took hour-long ‘shifts’ so we could recharge during the off time and come back to D patience-loaded. Beyond that, might I suggest some deep breathing. Laughing at the craziness of it all. Remembering this won’t last forever. And some treats for yourself at the end of each night help too — hello bath bombs and dark chocolate! Disclaimer: The tips and tricks shared above are based on my own experience and do not guarantee any success. The links to products are also sponsored, because, hey – a girl needs to eat!